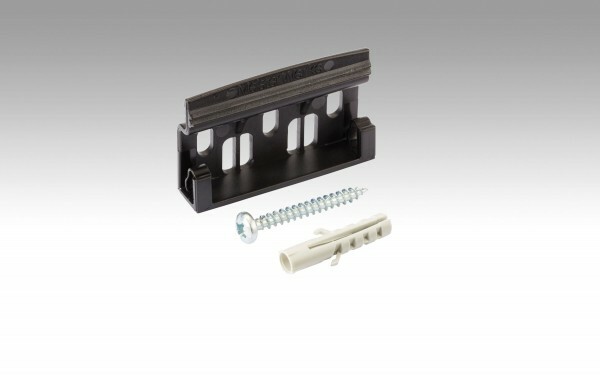 Información del producto "Accessories | Clip fastening system"
Our Clip fastening system is the perfect choice for quick and easy assembly of wineo skirting boards. Cables can be routed out of sight, and the skirting boards can be removed without any problems if you want to paint or wallpaper the walls. Position the Clipholder on the wall and mark the drill holes with a pencil. Check the instructions on the Clip box with regard to spacing. Don't space the holes too far apart otherwise the boards may bend away from the wall between two drill holes. You want the boards to lay flat along the wall. First, drill the holes and bolt the Clip to the wall using the plugs and screws provided. Before clipping the skirting board onto the Clip from above, make sure you have laid any cables in the room out of sight using the cable guides in the skirting board fastening system. Make sure the cables aren't too thick, otherwise you won't be able to clip the skirting board fully onto the Clip, and a gap may be left between skirting board and flooring. Once the cables have been laid, just clip the skirting board onto the Clip until it latches into place and the board lies flat on the flooring. Sufficient for approx. 20 m.